The above article was recently published by the South African Daily Maverick newspaper and I will return to that later on in this piece. But looking back three and a half years ago, I published that still frame picture on my blog appealing for any information that would lead to the discovery of its film taken by a Mr. G. E. Taylor at Loch Ness in 1938. The first part of that strategy was fulfilled in that the article was highly visible on the Internet. In other words, a google search for "G E Taylor Loch Ness Monster" put the article as the number one hit. The second part, in which someone would actually reply with some new information, never came to pass. While this was disappointing it was also somewhat worrying as one would assume that anyone who was a descendant or close associate of Mr. Taylor and knew about the film would be sufficiently Internet savvy to at some point search for this film and find the article. This digital silence could mean one of several things. People may have relevant information but do not wish to divulge it. Or it could be that such people are unaware of such a film, either because they have not looked for it or because the film is now no more. I hope it is not the last of these possibilities, but it would always be a hard thing to confirm. The other problem was that I did not know G. E. Taylor's full name. Descendants of Mr. Taylor may have searched for information on him by using his full name. Also, if they were not aware of his Loch Ness connection, then "loch ness" would not appear on their search input and so my article would be way down the list of hits (I have recently updated the article to "seed" it with common names that may match the "G" and "E". These are there only to lock into certain google search patterns). That article remains, but it is not clear if it now still fulfils its original purpose. Expanding the search, enquiring of ancestry websites was the other obvious pursuit, though for me it resulted in tenuous matches. Scotland has a good genealogy site, as do others, and South Africa is also providing such online services. One problem is it costs money, the other problem is one of priority. A search of the National Archives of South Africa indicates that the digitised archive does not go beyond 1950. Presumably, that is a fluid situation as more births, deaths and marriages are scanned and put online. But this is not a surprise as the service primarily caters to historians and genealogists and that means categorising the older data first and then working your way up to the present day. The trick is again knowing what the "G. E." stands for. and I suspect this may involve going through the paywall of various genealogical websites to get some (if any) information. However, the main source of information would be the register of births, deaths and marriages in Pietermaritzburg. That may ultimately require the paid employment of a local researcher. Other lines of enquiry were more proactive. 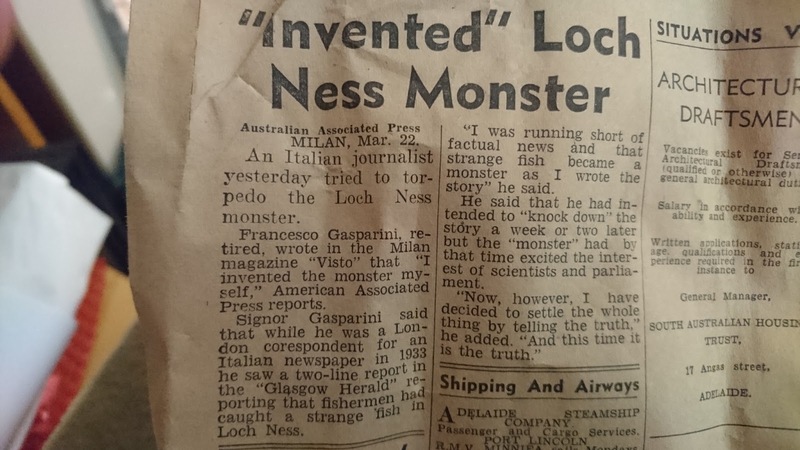 I contacted the National Film Video and Sound Archive in South Africa regarding the old newsreels to see if anything regarding Loch Ness Monster films appeared on the "African Mirror" newsreels around 1938 or 1961. Again, nothing turned up. I then paid for an advert to be placed in the Notices sections of the popular Sunday Times for three weeks running. 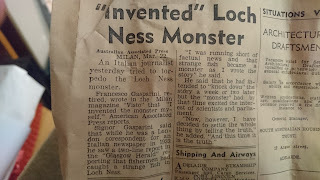 Again, nothing, but it piqued the interest of a local journalist who contacted me and with my input ran an article concerning South Africa's claim to fame in producing the first colour film of the Loch Ness Monster and the subsequent disappearance of that film. That also ended with an appeal for more information. Where that will lead remains an open matter. At the time of writing, there are only a couple of leads but nothing that is truly substantial. However, I have enough new material for an article on the G. E. Taylor film. That will go ahead, but ultimately there can be no really incisive analysis without the actual film.